Diagnostic efficiency™ is about adaptation… sticking and moving just like how Sugar Ray Leonard boxed in the 1980s, the veterinarian must mentally adjust to what is presented and find the modality that fits the clinical signs. I’ve always said, “If the problem in an “ADR” patient isn’t in the abdomen or the chest with the probe, then it must be orthopedic, metabolic or in the CNS." This is just one of those stick and move cases. This patient presented for a tense abdomen. The complete sonogram was innocuous but the sonographer noted a + Murphy sign (pain upon imaging) in the cranial abdomen caudal to the ribs…. This is often referred back pain where the clinical sonographer can feel the difference of body wall tension upon the scanning hand between superficial tenseness owing to referred disc pain versus the deeper visceral pain such as that of pancreatitis. This clinical sign along with a clean abdominal ultrasound says >>> CT the spine and boom! We have our answer. Within 6 hours, 2 veterinary facilities and 2 separate remote interpretations, coordination between 2 generalist veterinarians (Dr. John Ammeraal of American Animal Hospital and Dr. Ken Leal of Blairstown Animal Hospital) and 2 SonoPath specialists (telemedicine of the sonogram by Eric Lindquist, DMV, DABVP and telemedicine of the CT by Nele Ondreka, DVM, Dr. med. vet., DipECVDI) a precise dx was found by the clinical "stick and move" thought process. An 11-year-old MN Yorkshire Terrier presented for a second opinion for a 4-week history of back pain; an L2 lesion is suspected. Previous treatments were Gabapentin and Tramadol, but the patient showed no improvement. The patient was still very painful, reluctant to move, and baring teeth when owner tried to pick him up. The area of L2 appeared normal on radiographs. CBC was WNL, blood chemistry found an Alk. Phos. of 187 and a PSA lipase of 528. Urinalysis showed 2+ protein. 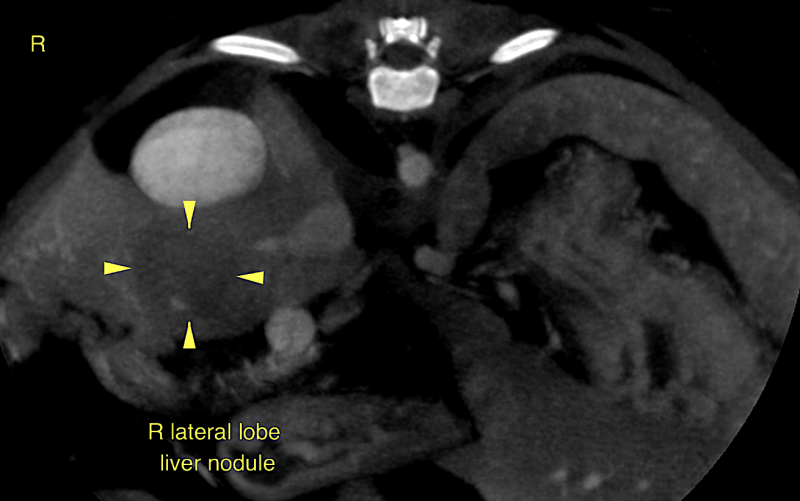 A left medial liver nodule, likely lipogranuloma or benign lesion with minor renal mineralization was seen on ultrasound. The sonographic findings were not contributing to this patient's pain and there was no evidence of visceral disease that could be contributing to the clinical signs. 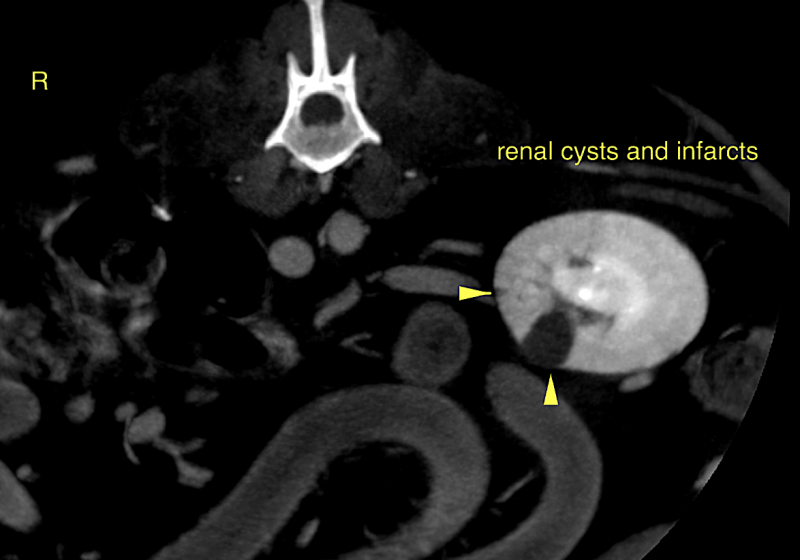 A CT of the spine with contrast was strongly recommended given the patient's symptoms. An aggressive osteolytic lesion of L2 vertebral body is noted occupying two thirds of the vertebral body. 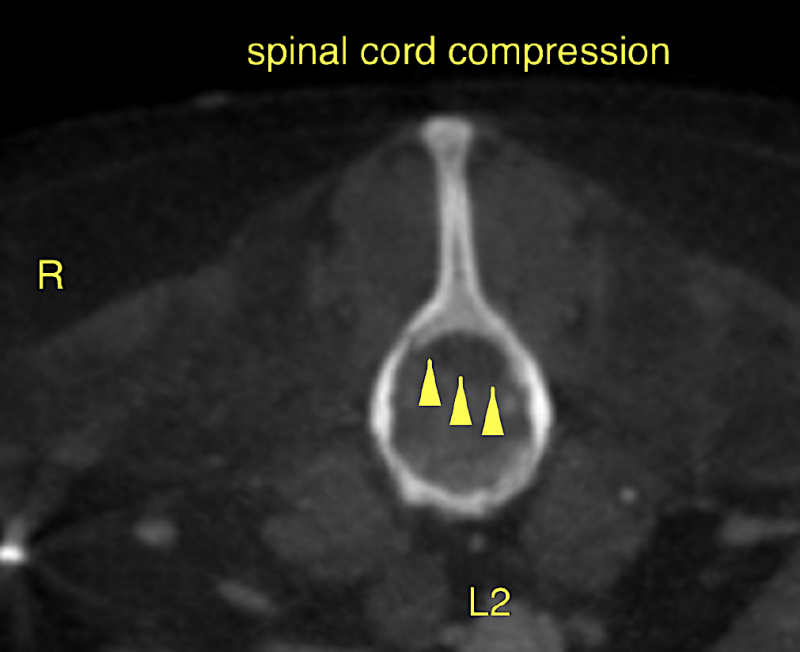 The dorsal cortex of the vertebral body of L2 is lost. There is a contrast enhancing soft tissue component of the lesion causing an extradural mass effect on the spinal cord from the ventral and right ventrolateral aspect. The soft tissue component of the mass occupies approximately 70% of the vertebral canal cross sectional area at maximum and causes deviation and severe compression of the spinal cord at the same level. 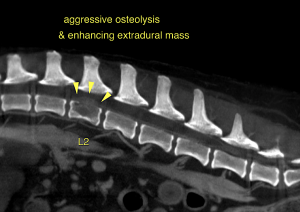 Monostotic aggressive osteolytic lesion of the L2 vertebra with severe extradural compressive myelopathy. The CT findings are compatible with a primary bone tumor until proven otherwise. Most likely differential diagnoses are osteosarcoma, chondrosarcoma, hemangiosarcoma, fibrosarcoma, or other. The possibility of metastasis of another primary tumor cannot be ruled out entirely. However, in the portions of the thorax and abdomen imaged, no evidence of another primary tumor was found. Unfortunately, the lesion is not resectable. Oncologist consult to discuss palliative tumor irradiation or chemotherapy could be considered. However, the long-term prognosis is poor.